Yes, this happened. Yesterday, Boston alt-rock band Guster, best known for their song “Satellite”, returned to their roots and busked in Harvard Square, Copley Square, Allston and outside South Station to promote the release of their seventh studio album, and first in five years, “Evermotion”. It was undoubtedly a very humble move for a prominent band to return to busking to debut brand new material to a hometown crowd. 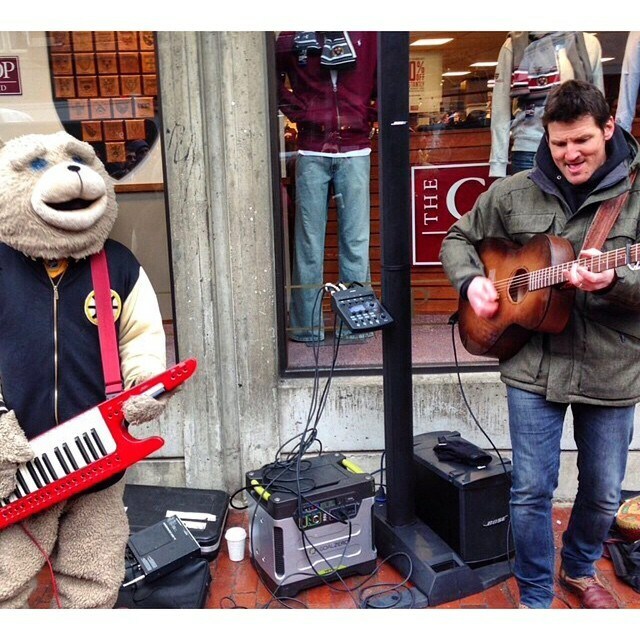 And who better to join them than the one and only busking man in a bear suit – Keytar Bear. So yes, Keytar Bear jammed with Guster, and it absolutely ruled. Also Keytar Bear rips a solo after the first chorus. Guster originally met at Tufts University in the early 1990s and spent time busking in Cambridge and Boston while studying. You can watch the whole set here.